There are many reasons why a lot of people would want to remodel their kitchens. Other people want to keep up with the trends and others just want a properly functioning kitchen for safety and convenience. New kitchen models prove to be both safe and convenient because of the new features and equipment used in the design. Kitchen remodeling has been a long-established business. A contract is used in conducting business as well as to seal the deal with the client. We have here simple steps for you to learn how to write a kitchen remodeling contract. Remodeling contract samples and templates are also provided to help you become more familiar with it. 1. Identify the parties involved in the contract. 2. Determine the terms and conditions you want to include in your contract. 3. Write a draft using all the details you have gathered. 4. Ask opinion from people in the same line of business. 5. Review and make changes to your work. What is a kitchen remodeling contract? It is a formal written document that is used to record the details of the kitchen remodeling work to be done, including the scope of the remodeling job, how much will it cost, who will work on it, how long will it take to finish, and other duties and responsibilities of the two parties involved. The contract serves an agreement between the remodeling service provider and the client. Below are the steps that will guide you on how to write a kitchen remodeling contract. Specify the names of the parties who will take part in the contract. You should know their full names, addresses, and their relationship with each other. Make sure that you not only get their names right, but the spelling must be correct as well. If not, then a different individual may be bound by the contract. Decide on the terms and conditions to include in your contract. This includes the scope of work to be done, the payment school, payment amount, payment method, start and completion of the contract, parts to be changed, and other applicable contract clauses. With the information you have gathered above, you can now start writing your draft. Arrange all the details accordingly. 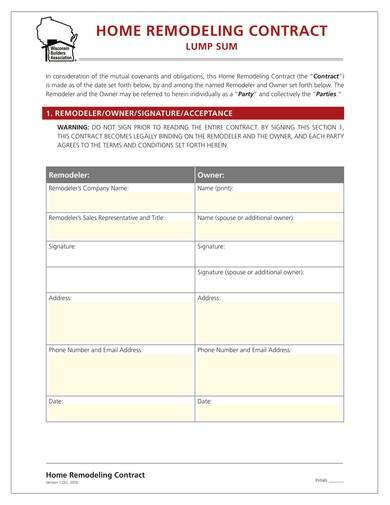 You can use home remodeling contract templates and renovation contract templates as your reference or guide to help you arrange the contents of your contract. If you have some doubts about the contract you just made, then do not hesitate to ask help from people who has experience in the same line of business. They can give you tips and advice that you can use too improve your contract and keep away from unwanted liabilities. Reread your contract and check if your work is still relevant and coherent after you have made the necessary changes. Also keep an eye on spelling and grammar errors as they may affect the credibility of your contract. When you are satisfied with your work, you may go ahead and print it for business use. This sample home/kitchen remodeling contract is a 21-page contract template complete with all the details necessary for the transaction. The parties involved here are referred to as the remodeler and the owner. The contents are divided into different sections and each section requires a certain group of information on it. A warning is also provided that no party should sign the contract before reading the entire contract because signing it would make the contract legally binding between the remodeler and the owner. 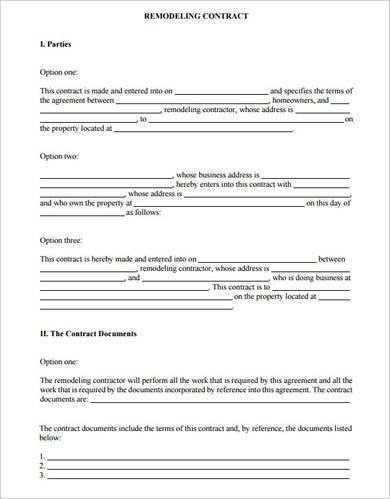 If you are looking for a simple, short, and straight-to-the-point kitchen remodeling contract, then this kitchen remodeling contract agreement template above is the one for you. The template is available in Word so you can easily make changes or complete the template using your computer or laptop. Printing copies is also a breeze. The required details include the date of the contract, the location and description of the remodeling job, the list of changes requested, and other terms and conditions. 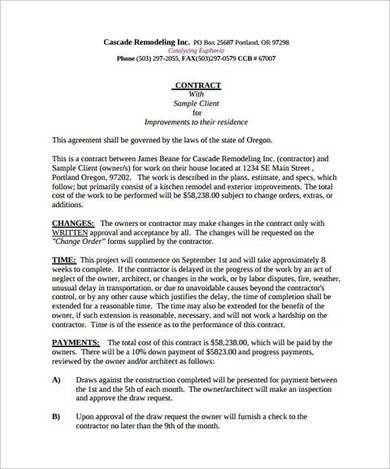 The sample contract template for kitchen remodeling is governed by the laws of the state of Oregon. The different sections in the contract are capitalized, underlined, and written in bold so that they can be easily identified. Some of the details provided in the contract include making changes to the contract, time, payment, protection of work and property, contractor’s liability insurance, warranty, dispute resolution, performance standards and requirements, etc. More than just remodeling is the need to improve one’s kitchen to be able to keep up with the growing needs of one’s family or household. 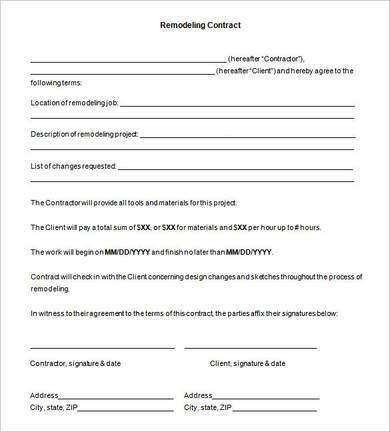 This kitchen improvement contract template is just the right template for any remodeler to use. It is detailed and the contents are arranged in a manner that is easy to read and understand. Every section is numbered and written in bold. 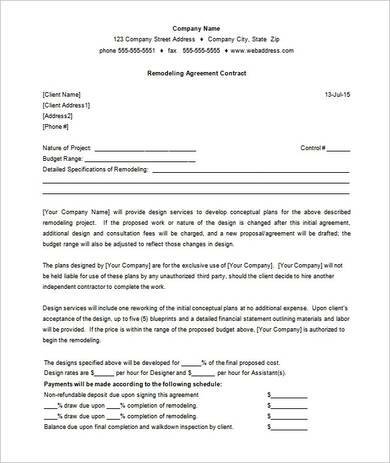 This simple kitchen remodeling contract template above includes the terms and conditions of the contract, an occupant acknowledgment statement, and a notice of cancellation provided at the last page. If the buyer wishes to cancel, they will need to do so any time before the midnight of the third business day after the effective date of the contract. 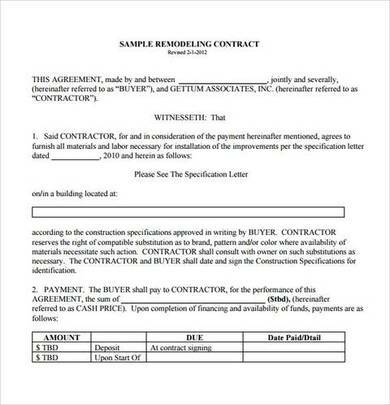 You can print as many copies of this remodeling agreement contract template as you want. The template allows you all the freedom to change the company name, date, client name, client address, phone number and other information easily as it is available in Word. Using any of these kitchen remodeling contract samples will surely help you produce a reliable and useful contract for your remodeling business. Other related articles you may find useful include interior design contract templates and home renovation project plan.